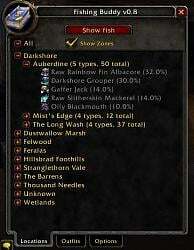 Yet another fishing support add-on. the list to be made into something more general that anyone can use). Updated from duplicate postin: HERE. Check there for updates if this falls behind. TackleBox -- still adding cool features to keep up with! Feel free to send comments to Sutorix on the Windrunner server. - Improve the detection of whether or not you can use the raft toy. 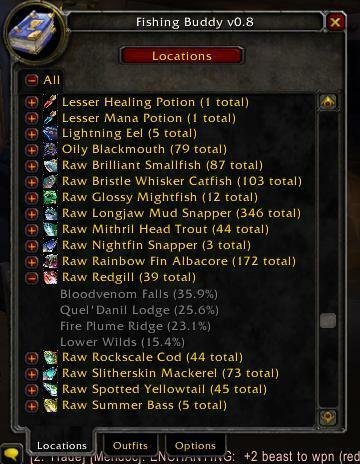 - Updated fishing macro support, with key binding. 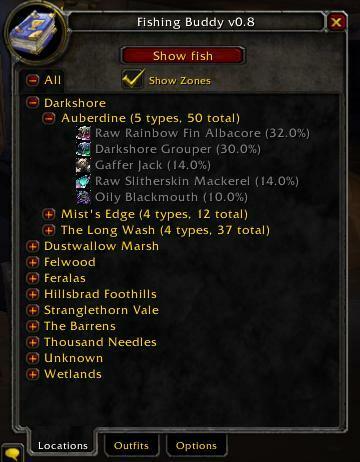 - Add knowledge of fishing skills for Zandalar. For the Horde! 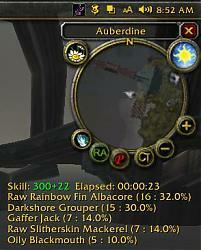 - Use Friend instead of Raid when displaying the 'Fisherfriend" line in the watcher. 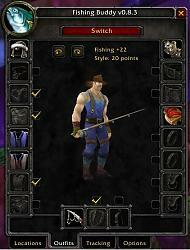 - The watcher window behaves better when fishing without a pole. - Update to latest LibBabble-SubZone. - Make the login banner optional. - Raid boss names were lost in translation, now they're back. - Use the Trawler Totem, if you have it. - More raid boss display cleanup, translations for boss names. - Fix issue with the raid code stealing the extra action bind. - Display "The Wish Remover" status when we're near the fountain. - "Oh, and it's also a great excuse to drink. Heavily." - Fix the bug(s) that stopped bobber and pet choices from sticking. - Fix raft support so that it works again. - Make the Tuskarr spear behave better. - Go back to the "real" LibBabble-SubZone and use a routine suggested by the author to merge in the missing entries. 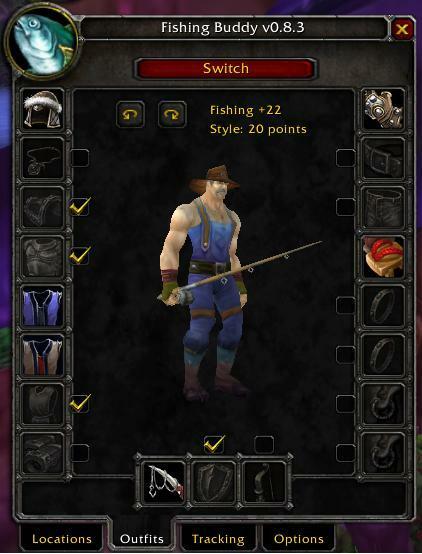 - Curseforge bug #276 - Draenor Fishing Pole works again. - Support for "Oversize Bobber"
with FB enabled the right click on titan panel does not show the full menu available. disable FB and titan panel works as normal. both addons have been updated recenly so its hard to tell which one is actually at fault. I havent had any lua errors with titan in a very long time.but before the last update of FB I had a few and had to disable some non important option with it to fix it at that time. I dont remember what option it was as it wasnt important for me to have the option enabled. Double luring with consumable lure and hat lure. Latest version double lures on the first cast without a current lure, using up a consumable lure and then replacing that with the hat lure. When it should only use the highest lure available. 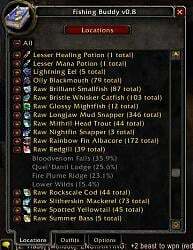 FB is applying a lure every cast, again. Last version fixed this. But it's back to applying a lure every single cast, in the latest version. When i fish for drowned mana i get action button for mark of something to summon that miniboss there on island.Is that action button part of FB and how do you move it if it is? 2x [ADDON_ACTION_BLOCKED] AddOn 'FishingBuddy' tried to call the protected function 'FishingActionButton:Hide()'. (*temporary) = "attempt to call field 'OnLoad' (a nil value)"
yell = "Riggle Bassbait yells: We have a winner! (%a+) is the Master Angler!" (*temporary) = "attempt to call field 'GetFishie' (a nil value)"
Last edited by Barleduq : 07-20-16 at 08:12 PM. as of July 23, 2015.
and I've asked the person before to please update here. Last edited by Barleduq : 07-28-15 at 09:08 AM. I am unsure which addon is the problem but my swatter, swats the following error from Outfitter when I began to fish for Fat Sleeper Fish in my Outpost in Nagrand. I also posted this in Outfitter's comments encase the actual error is in their addon. Thank you for sharing your Force. May the Goddess bless you. Last edited by techsgtchen : 11-20-14 at 04:48 PM. In 1.4b (updated 30 June 2014) the folders FB_Broker, FB_MregeDatabase, FB_OutfitDisplayFrame, FB_Titan, FB_TrackingFrame, and FuBar_FishingBuddyFu were still being distributed. Delete that addon completely. FishingBuddy implement DataBroker interface in the core, and has long since abandoned all the separate interface addons. And pretty please use CODE block for long listings. Last edited by AnrDaemon : 10-27-14 at 03:13 PM.